The East Side History Club’s final program for Spring ’11 featured East High alumni (class of ’53) John Olson and Dave Martinson presenting on East High Athletics during the “Championship Decade” of the 1960s. 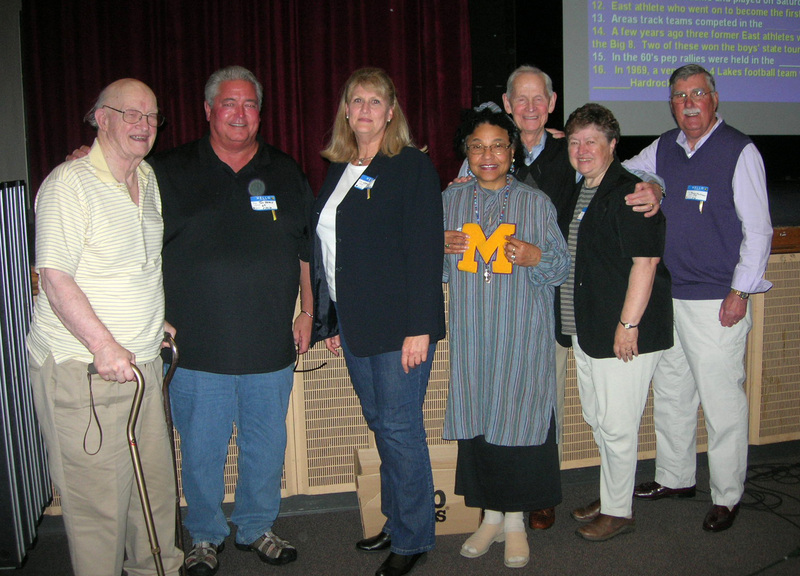 Their special guests Betty Nicka, Muriel Simms, Tim Healy, Jackie Zoch, and longtime coach Verlyn Belisle came to enjoy the trip down memory lane. From left: Coach Vernon Belisle, athletes Tim Healy, Jackie Zoch, and Muriel Simms; presenter John Olson, athlete Betty Micka, and presenter Dave Martinson. Verlyn Belisle, now retired from teaching and coaching at East High, was the only East High Coach to win state championships in two sports (Basketball, 1958 and Baseball, 1967). Tim Healy graduated from East High with the Class of 1969. During his high school career he took All State Honors in football and All Conference Honors in baseball. He went on to play for UW football as a quarterback. Tim is now a retired Madison Firefighter. Betty Lindberg-Nicka graduated from East High with the Class of 1955. This retired East High teacher originated Girls Athletics Association (GAA) at East and initiated inter-school competitive opportunities for East girls in 1965. She went on to coach East girls teams in tennis, basketball,volleyball and track. Jackie Zoch graduated from East High in the Class of 1967. In college she competed with the UW Crew team in positions of Rower and Stroke. She went on to the UW Women’s National Champion Crew-Stroke, and was a Bronze Medalist with the US National Women’s Rowing Team in the 1976 Summer Olympics. Muriel Simms graduated from East High in the Class of 1962. During her high school career she was a girls basketball letter winner and vice president of her junior class. She went on to earn a Bachelor’s degree in English (UWMadison, 1968), Master’s degree in Curriculum and Instruction and lifetime teaching license (UWMadison, 1975), administrator license (UWMadison, 1988), and doctorate in Educational Administration from the (UWMadison, 2002). Retired from a career that included stints as Madison School District teacher and administrator, and Professor of Educational Administration Studies at Edgewood College, she is currently conducting research on pioneer Black families in Madison. What do you think, East Side History lovers, shall we keep the East High Athletics programs coming, rolling on into the decade of Title IX and more sports triumphs for East High? 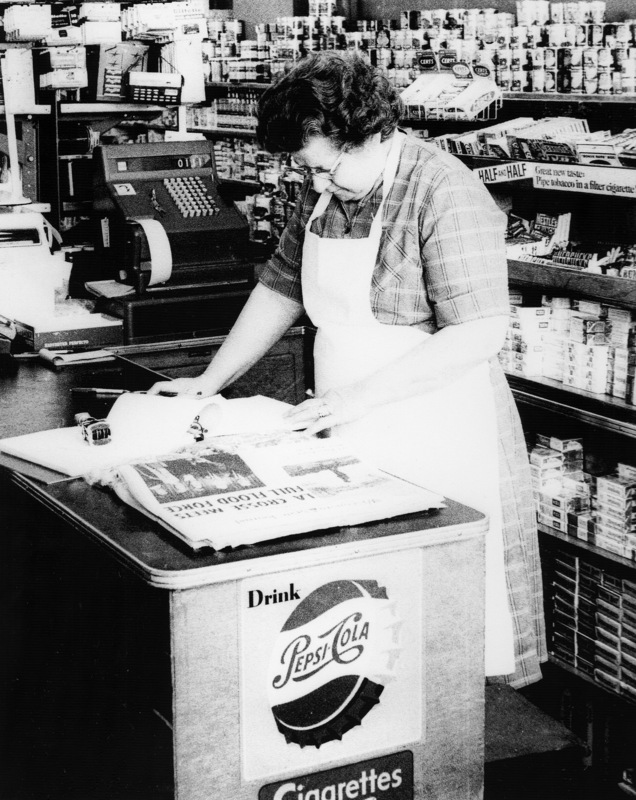 Judith (Foss) Porter and Ann Waidelich wrote the following on the history of the Foss “Royal Blue” Grocery at 2001 Atwood Avenue after our April 2011 meeting on that topic. “Thank you so much for allowing my brother (Marvin Foss) and me (Judith Foss Porter) to present a program on the Foss Royal Blue Grocery Store. It was such a privilege to honor my Mother and Father in such a terrific way. It has always been special to be caretaker of our family history but to share it with others who knew our family was so overwhelmingly great – again, thank you.” from a note received from Judith Foss Porter after the April 16th East Side History Club meeting. Peder Foss and Anna Forton were married in Stoughton on Feb. 5, 1886. They both had emigrated from Norway. They farmed in several areas around Madison and had 12 children. The youngest was Arnold, born Feb. 27, 1911. His mother died that day and he was baptized beside her casket. 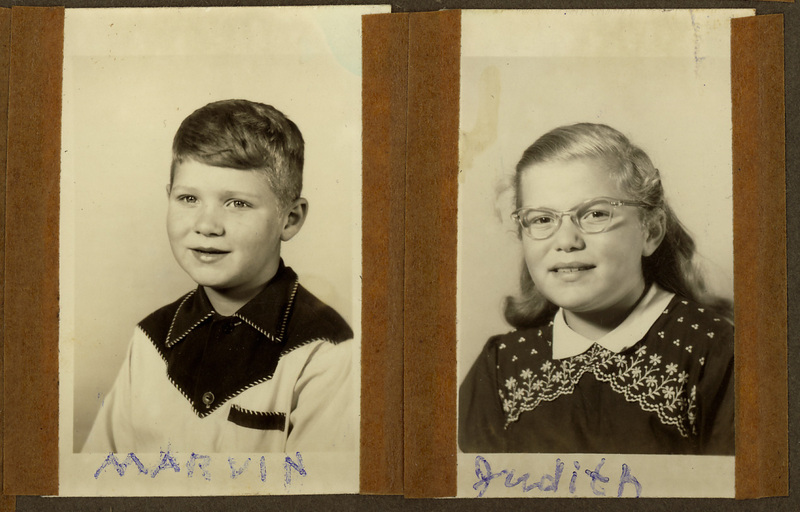 Arnold was raised by his only living sister Christina who was 22 years older than him. She and her husband Christian Arneson served as grandparents to Arnold’s children. Arnold attended high school in DeForest but didn’t graduate due to illness and the need to earn money to cover medical bills. Then the Depression hit. He married Sylvia Gest in May 1936, eloping to Rockford Illinois and honeymooning at Halverson’s near Stoughton on the way back. Her aunt & uncle, LaRoy & Alma Gest, owned the Gest Garage, Inn and Cabins on Hwy 51 and Co. Hwy. K. Arnold worked for A.J. Sweet, a wholesale fruit and produce company, driving a delivery truck. In the summer of 1936 they lived in Washington DC while Arnold worked for the US Dept. of Loans and Currency ! When they came back Arnold returned to his job at A.J. Sweet and they took up residence at 226 Buell Street. They lived there until the summer of 1950 when they moved, with their four children (Robert, Judith, Marvin and David) to 501 Pflaum Road, where they had a 27 acre farm that supplied many of the berries and vegetables that were sold at the Foss store. In the mean time his brother Bennie had been the manager at Kroger’s Grocery Store, 2001 Atwood Ave. In 1936 he and Louis Pfister, who owned the building, took over the store and renamed it Foss & Pfister. 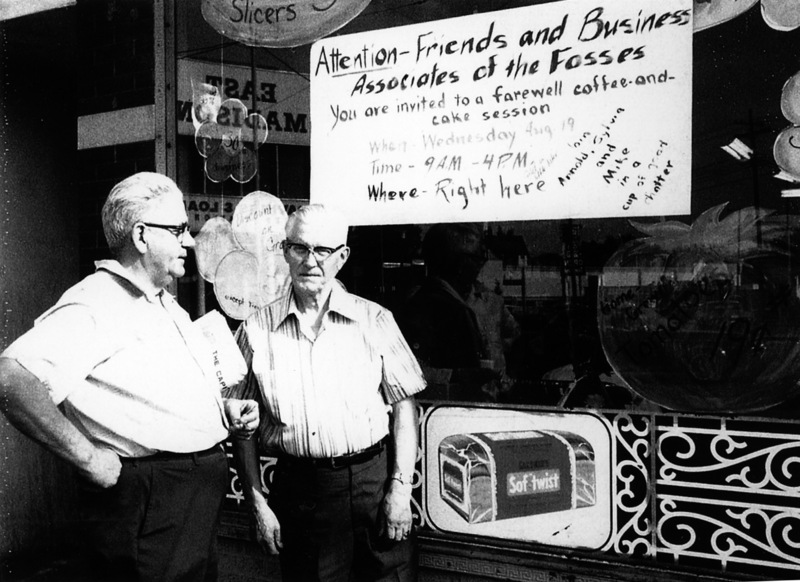 In June of 1937 Arnold borrowed money and bought half interest in the store which then became Foss Brothers Grocery. In 1942 Arnold and his wife, who also worked in the store, bought out Bennie’s share so that he could run a berry and poultry farm in Monona which he has purchased from William Schultz. In 1947 they bought out Harry Hall’s Grocer, 1961 Winnebago St., and combined the two. 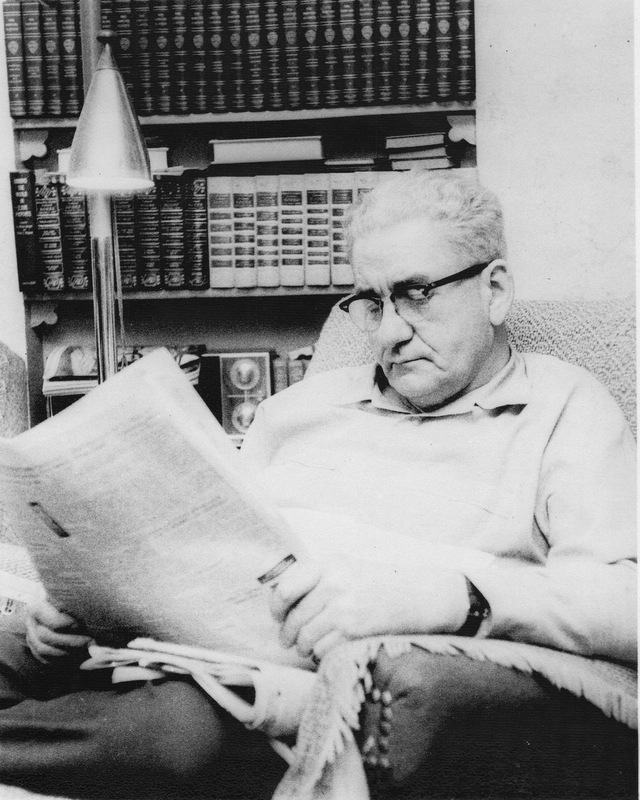 In October of 1947 Bennie, again, became a partner until he retired in 1960. He continued to work part-time until he died in February 1968. The building, that the store occupied, had been owned by Louis Pfister and then by Ted Fields, who had a law office upstairs. In 1960 Arnold & Sylvia bought the building. They closed the grocery store in 1970 and rented the space to other businesses. “Our health forced us to give it up. There was a lot of hard work in those 33 years but I think it was good for us. Like most people we did not have everything we wanted, but we did have everything we needed.” so wrote Arnold Foss. Arnold died in 1986. Arnold Foss with customer Iver Kalbakken shortly before the Foss “Royal Blue” Grocery closed in August 1970. A spilled wagon of groceries on the railroad tracks that Robert, with sister Judith as helper, were delivering to Mrs. Blick, near the Yahara River. Edith & Earl Hoppmann delivered their crates of eggs that we transferred to cartons – not always so carefully – yuk! Lots of Norwegian being spoken in the store. Lutefisk in November and inexpensive toys available for last minute shoppers in December. Mom sending us down the back street (Helena) to Schoep’s for more ice cream. Selling illegal colored Oleo from Rockford – wrapped in meat paper in 4# packages. The smell of the sweeping compound used every night to sweep the wooden floors and the hot wet feathers from the chicken plucker. New Year’s Eve inventory where everybody in the family 10 years old and older helped. David, our youngest brother, was so excited to finally make it to 10 years in 1959 and discover how boring it was. The store truck went to the dump regularly. The floorboards were so worn that we had to put our feet in a cardboard box on the passenger side. Join us for a slideshow/history by East High alumni Dave Martinson and John Olson. Several teams and individuals earned Madison, Big Eight, or State Championships during these ten years. This slideshow/history by East High alumni Dave Martinson and John Olson will review these golden years in the story of East High athletics at our meeting on May 21. We’ll met from 2-4 pm at the East High Auditorium. ARRIVAL & PARKING: You may drop passengers at the 4th Street entrance. The auditorium is directly down the hall and is wheelchair accessible. Some parking is available near that entrance. A larger parking lot is further down 4th Street. 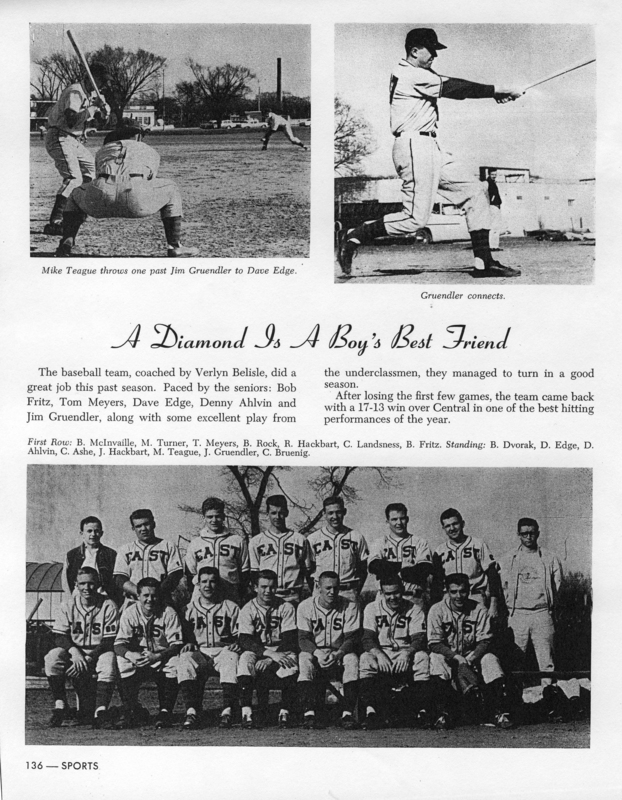 1962 baseball season recap from East High yearbook.